Can Feds Counter-Protest the White Supremacists in D.C. Without Violating the Hatch Act? Feds in the Washington, D.C.-area have likely heard about road closures and local emergency operations activations in anticipation of the Unite The Right 2 rally taking place on the National Mall on Sunday. 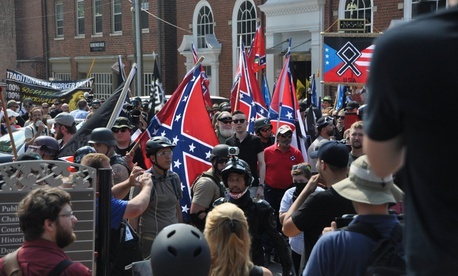 The organizers of 2017's infamous Charlottesville rally were approved to hold a rally on Aug. 12 with the stated purpose of highlighting "civil rights abuse in Charlottesville Va / white civil rights rally," according to the organizers' permit application to the National Park Service. NPS officials estimate that hundreds will attend the rally, with just as many likely counter-protesting the white nationalist event. According to WAMU, two dozen organizations are planning to counter-protest. There might even be some feds there, according to emails FOIA'd by transparency group Property of the People. 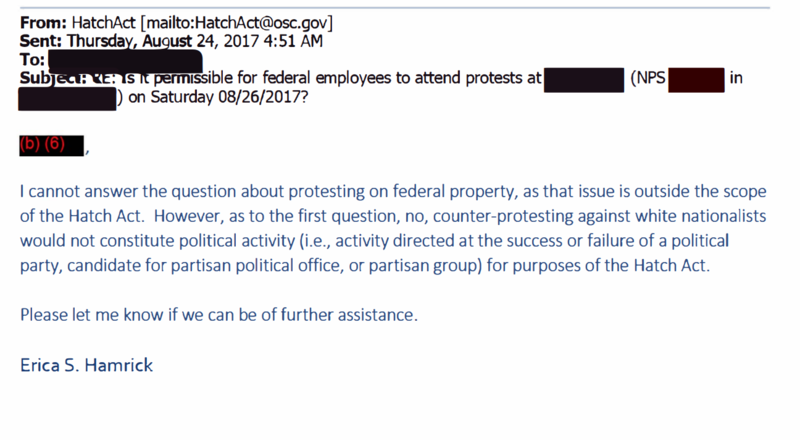 In a 2017 email exchange, a fed emailed the Office of Special Counsel asking if counter-protesting white nationalists on federal property would constitute a violation of the Hatch Act. While OSC's Erica S. Hamrick could not answer the question about federal property, she did say that "counter-protesting against white nationalists would not constitute political activity for purposes of the Hatch Act" because it would not specifically be a protest against "the success or failure of a political party, candidate for partisan political office, or partisan group." There is one small problem, though, as the original emailer states: The American Nazi Party is a political party, though it has not fielded viable candidates in any major races in recent years. The unnamed fed asked OSC if the American Nazi Party is not considered partisan for purposes of the Hatch Act because it is not "above a certain threshold." Hamrick did not respond to that question. OSC's Zachary Kurz said Friday that feds can attend the rally as long as they don't do so in an official capacity. "Even if the rally was organized by a political party, partisan political group, or candidate for partisan political office, most federal employees would be able to attend the rally so long as they were not on duty or wearing federal uniforms or insignia," Kurz said. Property of the People's Gunita Singh, echoing the fed, said in a blog post that the Hatch Act is not clear enough for feds in cases like this. "Many federal workers are confused about whether and to what extent they may exercise their free expression and assembly rights, even while off duty and off federal property," she wrote. "This is a real problem." Nick Schwellenbach, director of investigations for the nonprofit Project on Government Oversight and a former OSC staffer, said the Hatch Act would protect feds even on an NPS site like the National Mall. "Normally feds are restricted by the Hatch Act if they are off the clock but still in their federal building," he said. "But OSC doesn’t find that participation in political rallies (or counter rallies) on federal property that’s used as a convening place — e.g. a public square — is grounds for a Hatch Act violation." The 2017 Unite The Right rally sparked a national conversation about white nationalism after a man ran his car into a crowd of protestors, killing Heather Heyer. Unite The Right attendee James Fields Jr. was charged with second-degree murder and the event spurred dozens of hate crimes. President Trump used a press conference about infrastructure later that week to say that there were "fine people" at the original Unite The Right event and that "both sides" were to blame for the violence. According to Singh's analysis, it's within the Hatch Act rules for feds to counter-protest at Sunday's rally. 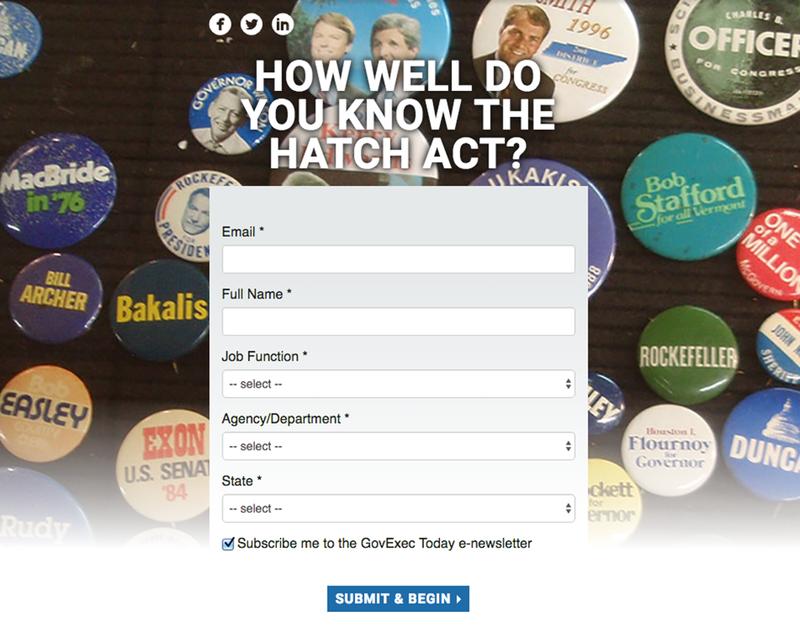 "If you’re a federal employee who wants to protest the white nationalist scourge converging on our nation’s capital, the Hatch Act has your back," she wrote. "As long as federal employees are off the clock, they won’t violate the Hatch Act whether they’re protestors or counter-protestors," Schwellenbach added.